2 1/4 X 14 Cast Iron Vent Cover (Air Return) Without Screw Holes Outside Measurement: 3.5" X 16"
All our Cast Iron grilles and vent covers are cast at least 3/16" thick. They are beautiful and guaranteed to last a lifetime. Available in traditional scroll design these grilles turn eye sores into assets that enhance the appearance and value of your home. You have the option to add a louver to each grille to create a floor register. Screw holes are also an option if you intend to use the grille on a sidewall or the ceiling. The scroll design, adapted from a traditional Victorian pattern is historically sensitive and appropriate for almost any application. This very popular grille can be found in historic restorations and fine homes throughout America. Each vent cover is individually manufactured and finished with a black, durable, baked-on powder coating. 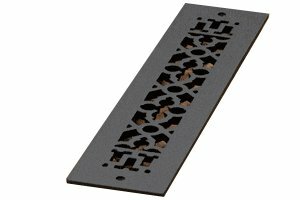 The Cast Iron Grilles can be used as a duct cover or HVAC vent cover. All sizes are the size of the duct opening. To determine overall dimesion add 2" to both the length and width. If you have any questions about this product by Vent Covers Unlimited, contact us by completing and submitting the form below. If you are looking for a specif part number, please include it with your message.